On January 20th, Paragon at Columbia Overlook, a new apartment community coming to Columbia, Maryland, will begin offering the first tours of its new community. Never mind the spacious apartments with the nine-foot ceilings, granite countertops, high-end wood cabinetry, and upgraded flooring, what’s most interesting about Paragon at Columbia Overlook is the unique set of amenities this community will offer its residents. The Paragon lifestyle allows residents all the 'me time' they crave, with proximity to shopping, recreation and transportation, and Columbia provides the opportunities to engage in the activities they love. On January 20th, Paragon at Columbia Overlook, a new apartment community coming to Columbia, Maryland, will begin offering the first tours of its new community. Located next to the Costco in the Gateway Overlook Shopping Center on Rt. 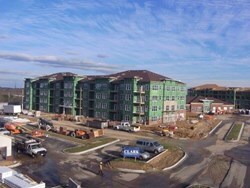 108, the first residential building and leasing center for the community are scheduled to open in February. Once fully complete, the community will have five distinctive, four-story, elevator-served apartment buildings with a total of 320 apartments offering one and two-bedroom floor plans. Never mind the spacious apartments with the nine-foot ceilings, granite countertops, high-end wood cabinetry, and upgraded flooring, what’s most interesting about Paragon at Columbia Overlook is the unique set of amenities this community will offer its residents. Tailored to the active lifestyles of the surrounding community, Paragon will feature a first-class Resident's Club, 24/7 fitness center, saltwater pool, greenhouse, Adventure Center, and many more unique, word-class amenities. The Adventure Center will feature an area to repair bikes which directly reflects Columbia residents’ interest in biking and the miles of bike trails that are heavily used in the area. It will also provide storage for kayaks and canoes which are also heavily used at the many lakes in Columbia. The fitness center will not only be state-of-the-art, but will also accommodate any schedule with 24/7, on-demand, virtual fitness classes for groups or individuals. To further support the healthy lifestyles of its residents, the community’s greenhouse will allow year-round growing of fruits and vegetables which speaks to the demand for fresh, organic, locally grown produce. And considering that 65% or more of us are pet owners, the community will also be pet-friendly with a bark park and pet-washing station which will certainly please our four-legged friends. Even more impressive is that in recognition of today’s environmental sensibilities, the community has been built to LEED Silver standards. LEED stands for Leadership in Energy and Environmental Design and is an internationally recognized green building certification system developed by the U.S. Green Building Council (USGBC). In order to be certified, the community must achieve standards for high efficiency heating and cooling systems, energy efficient appliances, high efficiency hot water heating, energy efficient lighting, and indoor environment quality, just to name a few. Due to high demand, the community is already accepting applications and the schedule for tours is filling quickly. If the current leasing pace is any indication of future interest, Paragon at Columbia Overlook is likely to be Columbia’s hottest new address. For more information about Paragon at Columbia Overlook, visit their website at http://www.paragoncolumbia.com or contact the leasing center at 410.312.0500.